eliminate. The underlying debt to the mortgage company was eliminated. 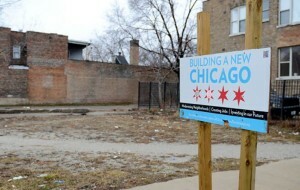 However, my former client still owns the property and is subject to ongoing city of Chicago violations. The foreclosure case on this particular piece of property commenced approximately five years ago. Once the chapter 7 bankruptcy case was filed, there was no further obligation to the mortgage company. However, there was a dilapidated structure on the property which had to be condemned and demolished by the city of Chicago. 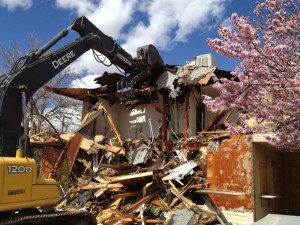 My client was forced to endure a $15,000 expense for the demolition. He did so believing that that would be the final expense related to the property as the case was currently going through foreclosure. What he did not know and what no one could have predicted at the moment was that the foreclosure case was not going to proceed to conclusion. Fast forward approximately one year. The vacant lot which he currently still owns because the foreclosure case never concluded is now causing additional problems. 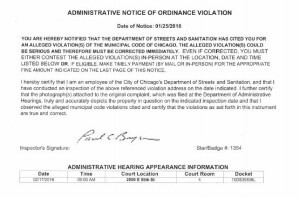 A different governmental branch from the City of Chicago known as streets and sanitation is citing my former client for failure to maintain a fence surrounding the property and failure to keep the property clear of debris. He must appear before an administrative hearing and pay significant fines based upon this fact. To try and help alleviate his financial situation, I made numerous calls to the City of Chicago and spoke to numerous people at the department of streets and sanitation, law department, and even an independent person that often buys property back on behalf of the city. 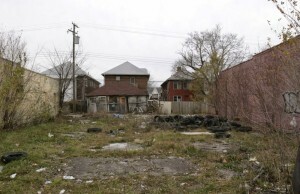 Unfortunately, the city’s prior amnesty program with regard to accepting deeds on vacant lots has ended in 2015 and the city is under a directive at this time to not buy back a single property of real estate. Thus, my former client is on the hook for the city violations as they relate to this property that he still technically owns. my former client who is no longer a resident of the city. I personally believe that my client has done everything that he could by way of the property. He filed a Chapter 7 bankruptcy, he paid for the demolition of the property after his bankruptcy and he believed that the foreclosure case would relieve him of his ownership obligations. I believe that if my client explains this situation in full to the judge, he may find a favorable result awaiting him. The bottom line is this. If you invest in real estate, make certain that the parcel of real estate is going to be desirable enough for either a third-party buyer or for the mortgage company to complete the foreclosure process on so that they can resell it on the open market. If you buy a terrible house in a terrible area, you may actually be stuck with the responsibility forever.